Benchmark looks at 12 products and systems of interest for security installers and system integrators involved in the design and installation of advanced intruder detection solutions. The Ricochet-enabled LCDLP-W wireless keypad is designed to be visually identical to the hard-wired LCDLP keypad. The similarity is not just in terms of aesthetics and footprint; the functionality is exactly the same too. Rather than producing a wireless keypad that acts solely as an arming/disarming station, the Texecom LCDLP-W wireless keypad allows full programming and advanced functionality, just as the hardwired keypad does. The benefit for installers and integrators is that they can carry the wireless keypad with them during installation and commissioning, negating the need to return to the keypad frequently. It is also worth remembering that being a Ricochet device means the keypad can be used as a repeater for other field devices, if required. For the user, the LCDLP-W acts as the hard-wired LCDLP does with one small exception. If using a prox tag, the keypad needs a single key press to wake it up before presenting the tag. If a code is being entered, the first digit of the code not only wakes the keypad but is also registered so there are no additional keystrokes. The Redwall PIE-1 is a PoE-enabled IP encoder which transforms normally closed relay output signals from a standard detector into ASCII code that can be used with digital solutions such as a VMS. It also can be used to power the connected detector from a PoE injector or switch. The unit features an integral webpage which allows configurations to be carried out over a LAN connection using the Microsoft Internet Explorer browser. The Redwall PIE-1 is designed to fit into a dual gang box and includes a steel mounting plate to allow a Redwall SIP detector to be mounted onto the box. It is also supplied with pre-terminated cables to simplify the various connections for alarms and power output. The unit features two RJ45 connections: one for a link to the detectors and one for PoE input. There is also a modular connection for alarm input from the detector, plus power connections for 12V and 24V DC to the detector if an optional heater is used. The installation process is straightforward. Laser-Watch is a sensor for detecting objects and humans with accuracy over ranges of up to 500 metres. It incorporates programmable detection range and 20 fully adaptable alarm zones. Laser-Watch can be used as a standalone unit or as part of a security system with multiple IP sensors and cameras. 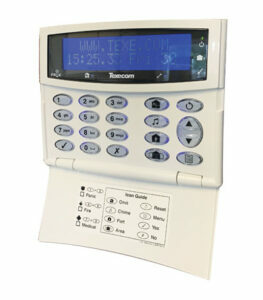 The fully adjustable alarm zones can each have their own sensitivity settings and alarm actions. The detector has an intuitive web-based user interface for fine-tuning settings and configuring network alarms. Laser-Watch not only detects intrusion, but reports the exact position of an object or human. Pyronix offers the DIGI-WIFI/XA communicator for its hybrid EURO 46 APP control panel. This communication option has been specifically designed to deliver more choices and more opportunities for installers and integrators when specifying communications options. With the DIGI-WIFI/XA, installations can enjoy more flexibility with regard to connectivity. The installation process involves fitting the control panel as standard, and the DIGI-WIFI/XA is then able to log in to the user’s existing Wi-Fi network. There is no requirement for running Ethernet cables or finding convenient cable entry locations. The DIGI-WIFI/XA module fits inside the panel, with the external antenna fixed up to 1 metre away. Given the high number of dual band wi-fi routers available, it should be noted that the DIGI-WIFI/XA is compatible with 2.4GHz wireless and not 5GHz. The DIGI-WIFI/XA can be used to link the HomeControl+ App and PyronixCloud, along with ARC connectivity via Fast Format IP, Contact ID IP or SIA 3 IP. Users can therefore enjoy flexibility with a smartphone app to control the security system, or ARC connection where higher risks exist and a police response is desirable. SICK’s TiM100 2D LiDAR sensor is a single-field laser scanner that offers users a budget level solution with high-resolution performance. With a 200° field of view and the ability to be mounted and aligned with the object needing protection, the TiM100 offers compact laser scanning for non-contact security of objects without the need for physical barriers. SICK’s iHDDM+ technology enables the sensor to deliver time-of-flight scanning with consistently stable results which are not affected by the presence of dirt, dust, moisture or ambient light. The TiM100 is the economy option within the series of LIDAR detection and ranging devices. The 100 x 60mm device weighs only 90g, so is suitable for many applications where conventional laser scanning detection devices are too large or too conspicuous. The TXF-125E is a battery powered active infrared beam detector from Takex. The batteries can be used to power a wireless transmitter through a battery sharing function. The detectors feature an increased beam pitch, in common with the hard-wired versions of the sensor. Takex claims that this reduces occurrences of nuisance activations. The TXDF-125E has a quoted range of 100 metres. Range is selectable, and other option are 75, 50 and 25 metres. The manufacturer also states that unit power is 100 times greater than required to deliver consistent performance in harsh environmental conditions. The modulated pulsed beam can be set at one of four frequencies to prevent cross-talk when devices are stacked. The detectors are designed for fast and simple optical alignment; an optional wireless alignment checker is also available. Battery life is quoted as five years for both the transmitter and receiver units. Performance in Benchmark testing was very good, and all breaches were correctly detected and signalled. These included rapid motion and attempts at evading detection. Even in poor climatic conditions the detectors were both reliable in terms of catch performance and stable. Vanderbilt offers SPC Connect Pro, a new programming tool for SPC systems. It is a desktop application that allows security installers and system integrators to program all the functionality of SPC systems. The Pro application has been designed to use the same interface as the SPC web page. This ensures continuity no matter how installers and integrators decide to program their systems; the interface and programming options use the same interface. Several operations have been enhanced for installers and integrators. The tool maintains a back-up of configurations files, allowing access to older files via a PC if changes have been made and reference is needed to older settings. Engineers also have the freedom to define configurations, which can then be quickly reused at other installations. The tool also features a new support system that provides the latest support information from Vanderbilt, with access to manuals and other support materials. With additional support in the SPC 3.8.5 firmware, SPC panels will now be discoverable when the panel is in full engineer mode, making connecting to systems faster and easier. For security professionals who are already using SPC Connect cloud services, the tool allows access to systems from the interface, creating a secure connection to support customers. An SPC Connect installer account is required to access the tool. Signing up for an account is free of charge, and installers and integrators can use the tool immediately. Risco is billing its Beyond detectors as ‘next generation’ external sensors. The Beyond range currently includes a hard-wired option, with a wireless model to follow shortly. Beyond is an outdoor detection solution, providing ‘best in class’ catch performance according to the manufacturer. The Beyond technology is based on a set of passive infrared and microwave technologies to meet the challenges of outdoor volumetric detection. The sensor makes use of two K-Band microwave sensors and two PIR channels to deliver what is claimed to be a combination of accurate detect and false alarm immunity. Beyond Wired is immediately available and Beyond Wireless is expected to be released in the near future. The Beyond detectors feature adjustable range control, and coverage is up to 12 metres with a 90° field of view. The detector includes integral EOL resistors to simplify installation, and the sensors are compatible with the Risco Bus system. The sensors are pet immune (up to 500mm head height) and include sway detection and digital correlation technologies. The DET-RWATER is a fully supervised wireless water detector that has been designed for use with the company’s i-on and Menvier control panels. The DET-RWATER will generate an alarm signal at the control panel if the presence of water is detected. For ease of location, the unit utilises a combination of radio functionality and a 1 metre cable to the detection head. This allows flexibility for most interior environments, including basements or for installation adjacent to machinery of appliances with a leak risk. The use of DET-RWATER can help reduce the financial and environmental impact of water leaks. It is adjustable for triggering on wet or on dry conditions, so can also be used to monitor water presence if required. The AXIS D2050-VE network radar detector senses approaching trespassers at a premises and provides accurate incident notifications in all weather conditions, around the clock. With 120° horizontal detection coverage and up to 50 metre range, the AXIS D2050-VE delivers exact position, angle of movement and velocity information about any moving object. It also minimises false alarms triggered by rain, snow, insects or shadows. The detector is vandal resistant and robust, making it ideal for use in outdoor environments. It can deliver filtered alarm information based upon distance and customisable detection zones. It also supports AXIS Radar Autotracking for PTZ cameras. Benefits include accurate incident notifications at night and in all weather conditions, the ability to filter based on distance and support for Power over Ethernet Plus (PoE+). Radar technology allows for a wide area to be covered for longer range perimeter protection. Developed primarily for medium-sized industrial installations, the product can be integrated with a wide range of security systems. The detector offers a longer range than most passive infrared sensors, covers a wide field of detection, and minimises false alarms triggered by spiders, small animals, moving shadows and light reflections. It can be used as a standalone product or as part of a larger security system. The TOWER-20AM PG2 is an innovative wireless outdoor mirror-based PIR detector which delivers accurate intruder detection with minimum false alarms. The detector features several technologies designed to overcome typical outdoor challenges such as rain, direct sunlight, animals, changing light levels, etc..
Visonic’s Octa-Quad technology, which uses eight PIR sensors each individually acting as a quad element detector, enables the Tower 20AM PG2 to accurately and reliably detect alarm events. The sensor features a robust housing and patented anti-masking protection to ensure that it is suitable for external use in security applications. The proprietary Octa-Quad technology distinguishes between a moving person, swaying trees and bushes, and small animals, minimising nuisance activations. It supports the PowerG wireless platform and battery life is quoted as three years in typical use. The detector makes use of black mirror optics to deliver high immunity to false alarms from sunlight and car headlights. EasySwitch is a range of wireless transmitters and receivers for commercial and domestic applications. It offers a scalable mix-and-match solution which can be adapted to a range of applications. The wireless detectors can transmit across ranges of up to 200 metres, and receivers support up to 16 detectors. The battery powered, weatherproofed and self contained PIR detectors with integral transmitters offer design flexibility. Remote control is achieved via a simple key fob transmitter device, which can support multiple channels. Remotely controlled sockets combined with a key fob transmitter allow installers and integrators to create an automated system quickly and easily. This can also include remote control of home appliances and lighting. Up to four devices can be controlled with a single key fob. There is also a receiver specifically designed for control of HVAC systems.